We're not going to add fire to an issue that's already burning hot. Clearly, Binibining Pilipinas International 2017 Mariel de Leon surprised everyone when she declared, "It's always country over crown." This was her defense against people who chastised her for speaking her mind and threatened not to support her in beauty pageant text polls. Despite the onslaught of critics, Mariel seemed unfazed. However, later on, perhaps in deference to the organization she represents, she attempted to defuse the situation by deleting some of her fiercest tweets. She really shouldn't have deleted them all, as many of them were empowering to women—no matter where they may be in the political spectrum. 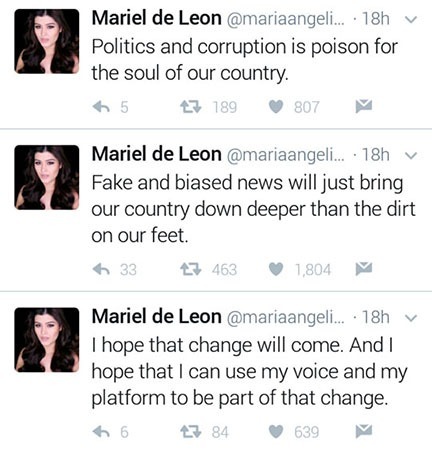 Fortunately, PEP.ph took screenshots of some Mariel's fiercest tweets. (2/2) See, beauty pageants aren't just for "standing there and looking pretty".